If you are feeling overwhelmed by trying to figure out all your options for diapers, you are not alone. 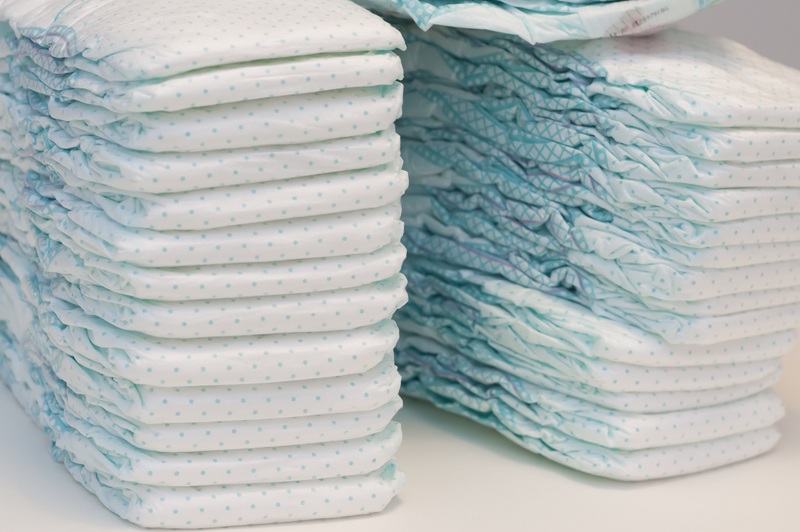 There are tons of diaper choices out there, and in this blog post you can learn how many diapers you might use in a day, the basics of cloth versus disposable, and what you can expect in terms of cost. Widely available in many varieties, disposable diapers are a common choice for new parents. They are called disposable diapers because, rather than saving the diaper and cleaning it, you throw it away once baby has used it. Popular brands of traditional disposables include Pampers, Huggies, and Luvs. These days you can also find diapers that profess to be more eco-friendly, whether they are made with fewer scents or less bleaching or even of different materials that may biodegrade more easily. If the eco route appeals to you, some brands to check out are Seventh Generation, Bambo, and Babyganics. And many stores have their own generic brand of diapers that some parents use with success: Target’s Up & Up and Costco’s Kirkland diapers are two of these options. Flats: are essentially just big squares of absorbent fabric that you can fold into diaper-like shapes. Parents like their customizability and how easy they are to wash.
Prefolds: are created by sewing together layers of fabric. This makes for a smallish rectangle of very absorbent fabric that you can fit around baby. Fitteds: are in the shape of a disposable diaper, but made of absorbent cloth. People generally snap or velcro a water resistant or waterproof cover over flats, prefolds, and fitteds as these diapers do not have a waterproof outer layer. All-in-twos: are composed of a waterproof cover into which you can snap or tuck an absorbent layer. Pocket diapers: have a waterproof cover and a soft inner lining that form a pocket, into which you can tuck an absorbent layer. All-in-ones: are like disposables in that they are easy to grab and put on without extra folding or tucking steps, but they can be washed and reused. You can expect baby to use 2,500-3,000 diapers their first year. Because most babies don’t learn to use the potty until they’re close to two and a half or three years old, add another 3,000 diapers onto that—at least! Thus, the low estimate is that you’ll buy 6,000 disposable diapers for one child. At 25 cents a diaper (an average cost) you’d spend at least $1,500 to diaper your child. Buying cloth diapers is a bit different. There are online forums where you can buy used diapers in good condition, but if you buy new cloth diapers, you could spend anywhere from $100 to $1000 dollars one time. If you’re washing cloth diapers at your house, then you might see a $5-$10 increase in your water bill monthly, so add the cost of diapers ($390) to the cost of water or washing ($360) for an average of about $750 total cost to cloth diaper your child. New Kids Center, How Many Diapers Does a Baby Use a Day?